You can sign up to receive our newsletter at the bottom of the page. Police in Edinburgh, the City of Edinburgh Council and Edinburgh’s Third Sector are continuing to work with the community to create a city free from Islamophobia and associated prejudice behaviour. A total fund of £40,000 has been contributed to by Police Scotland, City of Edinburgh Council and Scottish Government. Its purpose of the Shared Vision – Your Decision initiative is to help local people deliver innovative projects which reduce prejudice and foster positive relationships between diverse communities. Between 10 November and 12 December 2016, applications were submitted for projects to receive up to £5,000 from the total fund. Residents were then asked to decide which of 34 projects, who collectively applied for over £120,000, were given funding. A vote was launched on 28 January, running until 13 February, at an event in the city which brought together the projects and the public. Amina, The Muslim Women’s Resource Centre – Based on the human library concept that breaks down prejudice through social interaction of people over a cup of tea. Amina, The Muslim Women’s Resource Centre – Muslim women deliver interactive workshops aimed at building more integrated, socially cohesive communities, by safely challenging negative stereotypes & prejudices. Edinburgh Lone Fathers Project / Edinburgh Central Mosque ‘Dads & Kids Day – A day of fun, conversation and learning at the Edinburgh Central Mosque. Edinburgh Women’s Interfaith Group – EWIG would like to build bridges of friendship bringing the local community together celebrating all cultural, traditions and spiritual heritage. Edinburgh Interfaith Association – Raising awareness of Islam’s peaceful message, inviting non-Muslims to ‘Unite4Ramadan’, joining a Ramadan fast & sharing an evening meal at mosque. Just Enough Scotland – Delivering fun, educational workshops on radicalisation and terrorism in 10 Edinburgh schools. Trying to prevent further rise in hate crime. Kids In The Street, One Team, Many Cultures, One Goal – Raises awareness of the true meaning of faith through football, fun, food & learning. Leith Festival Association – Celebrating our Asian community highlighting and showcasing the varied communities, customs in the area through music, dance, art and food. LifeCare (Edinburgh) Limited – Breaking down boundaries and eroding prejudice across cultures, communities and generations through friendships for isolated over 60s in Edinburgh. Protest in Harmony – Singing and songwriting workshops at Edinburgh College to explore our similarities and differences, raising awareness of issues around Islamophobia. Scottish Faiths Action for Refugees – An interfaith series of monthly gatherings and events to increase intercultural understanding and build bridges between locals, refugees and migrants. Sikh Sanjog YGirls – A safe space for girls and young women to meet, share experiences, critically reflect and build self-esteem and resilience. The Welcoming Association – Learn about the experiences of refugee families in Edinburgh through community screenings and discussion of our short film ‘Syrian Voices’. Capital City Partnership, along with partners City of Edinburgh Council, EVOC, NHS Lothian and The Action Group, submitted a successful bid to the Scottish Government. 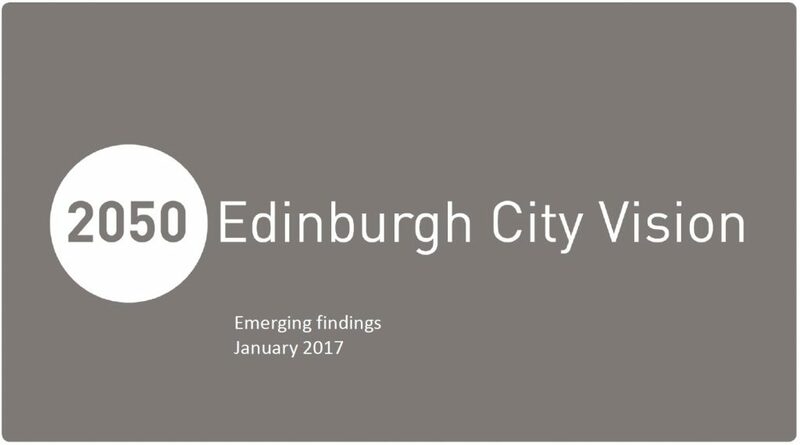 The proposal aims to ensure that employability provision in Edinburgh links with the emerging localities model. The “Joined Up for Jobs Integration Project” hopes to establish better employment outcomes for customers in regeneration areas, through joined up and ‘whole life’ approaches from key services working better together. 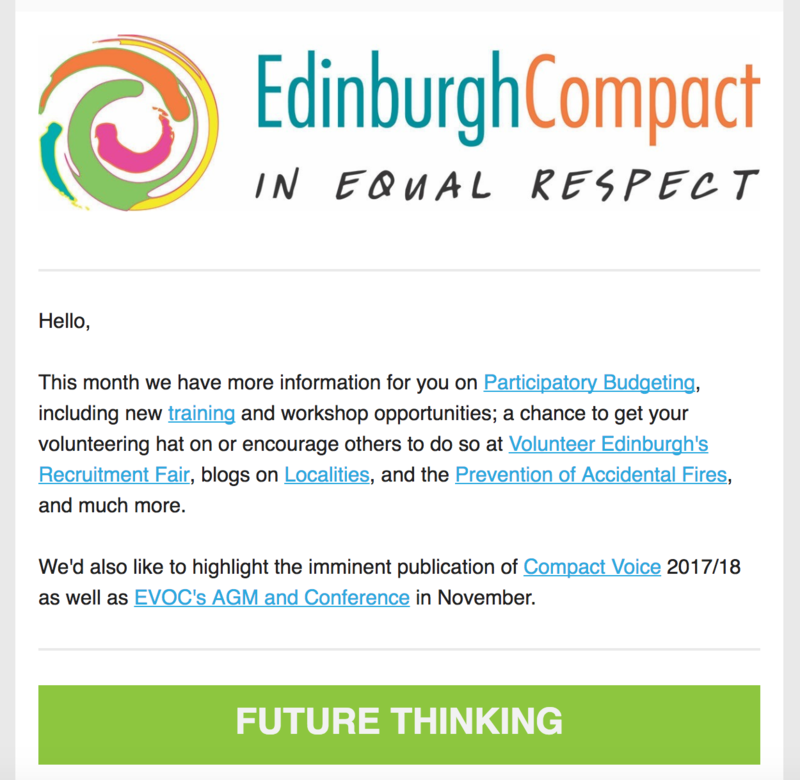 It brings together the Council’s Social Housing, Criminal Justice, and Health and Social Care agendas alongside the NHS and third sector partners represented currently by Edinburgh Voluntary Organisations Council and Joined Up for Jobs Forum. This approach is not about putting more frontline services in place, rather getting existing services to work collectively and bring about genuine, joined up and sustainable integration with a focus on housing, health and social care and criminal justice. • Evaluation report with shared learning event and good practice for sustainability. The project will commence in November 2017 and run until March 2019 with secondments to the project encouraged when new posts are advertised. The Scottish Fire and Rescue Service has a long history in delivering wide and varied prevention activities to improve safety and we take pride in the work we do and the difference we can make. We routinely attend fires within the home and we see the consequences of such incidents. So, while we can fight fires we believe that prevention is key – and we will make every effort to stop them from happening in the first place. With older people clearly being particularly at risk from fire, we offer a free Home Fire Safety Visit service which could save lives. These are a cornerstone of our prevention efforts and have contributed to a marked decrease in the number of incidents including those involving fatalities and casualties over the last decade. 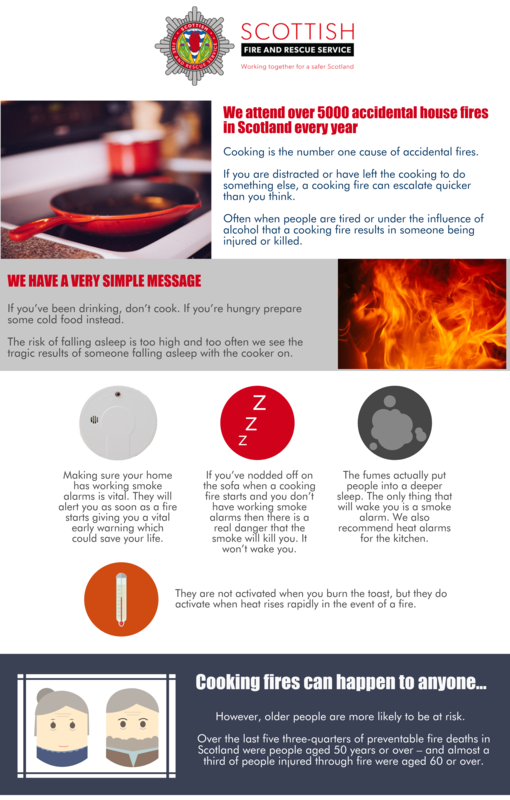 We received a referral for a Home fire safety check from a care worker for a young adult with learning difficulties that was easily distracted during cooking. Working together with partners involved in their care a community alarm linked fire alarm was fitted alongside a timer on the cooker. This reduced the risk considerably and with a tailored response plan allowed the person to fulfill their wish to live safely by themselves. The same approach can be used for gas, drug and alcohol dependent people, those with early dementia or mobility concerns, persons that hoard in the home. All this starts with one referral to the SFRS keep someone safe. We are here to help everyone stay safe within the home but we are particularly keen to support the most vulnerable and elderly within our communities. That is why we appeal to everyone to check if their elderly relatives, friends or neighbours are in need of this vital support – and to contact us directly. I recently attended Empowering our Communities, an event organised by the Scottish Government’s Ingage team. The event was billed as ‘a pop-up day of advice, inspiration and connections’. Like many of the delegates present, I’ve attended quite a few of these ‘inspirational’ events over the years, only to later be deflated by the grinding reality of funding cuts, tokenistic consultations and partnerships that are really partnerships in name only. Community planning systems and structures come and go, but one key element crucial to making it work is so often the thing that’s missing: the community! There are reasons to be optimistic that the new Localities being introduced across the city could see this change, however. Recent legislation like the Christie Commission and the Community Empowerment Act has given communities substantial new powers. Statutory agencies are now obliged to work with communities to produce community plans that have communities at their heart. And with an emphasis on genuine partnership working, we should see an end to top-down community planning, with councils and other statutory services doing things with communities and not to them. And given austerity and funding cuts in statutory services over recent times, there’s an acceptance that councils and statutory agencies simply can’t deliver services in the way they have in the past. There is a realisation that there really has to be a new way of working. Some local authorities have readily addressed these changing circumstances, and one of the highlights of the Empowering our Communities event was the premiere of Rocky Road, a short film made by Media Co-op. Rocky Road tells the story of a ‘switched-on’ Council – East Ayrshire – working alongside community activists, supporting them to help save their local community centre. Without wishing to spoil the ending (!) the film illustrates just what can be achieved through trust and by genuine partnership working. The film had a particular resonance for me as community centres in my own neck of the woods are currently going through challenging times as a consequence of the city council’s ‘transformation’ programme. They face uncertain futures as the number of front line Community Learning and Development staff has been slashed, with no indication yet of how centres which provide vital community services are to be managed and run in the future. The film, at least, had a happy ending – it remains to be seen if our local community centres will, too. The film demonstrated that with enlightened thinking things can change, but there needs to be a will to bring about that change. That will is certainly there in the third sector, where partnership working has been the norm for as long as I can remember. But this time, there are encouraging signs that the will to work together is also there within the statutory public services – they are certainly talking a good game. Talk is cheap, of course, and ultimately we must judge our partners not on what they say, but on what they do. Localities are in their infancy, but if communities are engaged from the outset maybe this time we can get community planning right. After all, no-one deliberately sets out to deliver poor public services, so it’s in all our interests to make this work. And wouldn’t we all love a story with a happy ending? Do you know you ASN’s from your PAR’s? Do you work in health or social care or with the public and statutory services? It is often difficult to get your head around the acronyms and abbreviations used to describe symptoms or refer to organisations and groups. Our Link Workers, have put together a glossary of helpful definitions, abbreviations and acronyms. Which you can download below. Check out our Twitter page to test yourself on our fun poll. Take a look at the Youth Participatory Budgeting video about how some young people in Edinburgh found the experience. Police in Edinburgh and the City of Edinburgh Council are continuing to work with the community to create a city free from Islamophobia and associated prejudice behaviour. A total fund of £40,000 has been contributed to by Police Scotland, City of Edinburgh Council and Scottish Government. Its purpose of the Shared Vision – Your Decision initiative is to help local people deliver innovative projects which reduce prejudice and foster positive relationships between diverse communities. Between 10 November and 12 December 2016, applications were submitted for projects to receive up to £5,000 from the total fund. Residents were then asked to decide which of 34 projects, who collectively applied for over £120,000, were given funding. A vote was launched on 28 January, running until 13 February, at an event in the city which brought together the projects and the public. Over 2500 people collectively voted at the event, online and at local libraries with thirteen projects now being given funding. Sergeant Scott Kennedy of Edinburgh’s Prevention’s Interventions & Partnerships (PIP) Team said: “It’s been really encouraging to see so many people eager to be involved and the support received from the public throughout this process. “We’ll continue to work together with all the projects to tackle prejudice and ensure that Edinburgh remains a welcoming and diverse city. Councillor Maureen Child, Convener of the Communities and Neighbourhood Committee, said: “Participatory budgeting exercises like this continue to be exceedingly popular, allowing local people to make real decisions about priority activities in their local area. Protest in Harmony – Singing and song writing workshops at Edinburgh College to explore our similarities and differences, raising awareness of issues around Islamophobia. Edinburgh should amongst other things be a Fairer City in 2050, this was one of the results of the 2050 Edinburgh City Vision consultations. To find out what they mean by fairer take a look at this short report on the early findings of the consultation. There are contacts at the end of the report to feedback on what you think of the findings so far. The ‘Keep Safe – I am Me’ initiative works in partnership with Police Scotland and a network of local businesses to create ‘Keep Safe’ places for disabled, vulnerable or elderly people to go if they feel frightened, distressed or are the victim of crime when out in the community. People can access registered ‘Keep Safe’ premises to seek assistance and help if they feel lost, confused, scared, in danger or have been the victim of a crime. ‘Keep Safe’ is already running in a number of shops, libraries, community centres and other premises across Scotland and we are now recruiting premises in Edinburgh.